April 30, 2011- Las Vegas, NV: From grocery-getting Expeditions to monstrous blue-tubed buggies, it was hard to miss the unlimited 4-wheel drive class known as Ultra4 at last weekend’s Best in the Desert Silver State 300. The Ultra4 class, identifiable by their 4400 numbers, proved once again that they can hold their own in the desert: They were both the largest class at the start line and the largest class to cross the finish line at Saturday’s 300 mile high-speed race through Nevada’s scenic back country. The drivers had weather on their side as cool temperatures kept overheating issues at bay and windy conditions made passing easier on a course that is already known to be a smooth, fast course well suited for many of the Ultra4 cars. The twice-crowned King of the Hammers, Shannon Campbell, claimed the top of the podium for the Ultra4s with a blisteringly fast speed. Not only did Campbell finish in front of 5 of the 8 classes that started before him, he also finished a full 30 minutes ahead of the next 4400 car, Team GenRight’s Tony Pellegrino. As Ultra4 fans will remember, Campbell and Pellegrino finished 1st and 2nd at this year’s King of the Hammers, and initially Silver State 300 looked to be a repeat performance for both drivers. However, on corrected time, 2nd place went to Gary Ferravanti, Jr., the son of Gary Ferravanti, Sr., who placed 6th in this year’s King of the Hammers. Tony Pellegrino claimed a close 3rdplace finish, and JT Taylor of Torchmate with no brakes for 200 miles would come from the back of the pack to finish 4th. 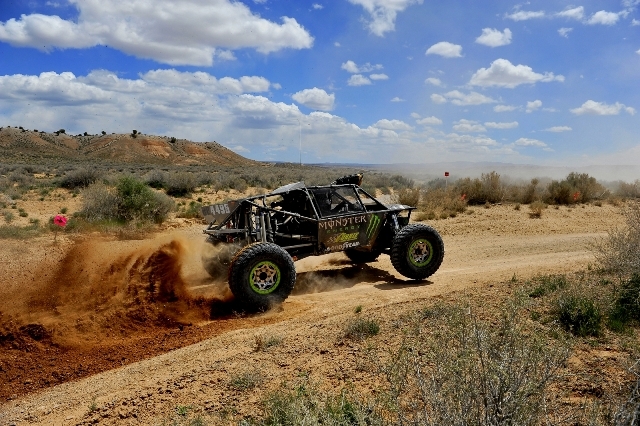 Silver State 300 was the 2nd race in the 2011 Ultra4 series, and with back-to-back podium finishes for both Campbell and Pellegrino, they will be a hard pair to beat as the series makes its way to Pennsylvania next month for the Rausch Creek Qualifier. Silver State 300 was also significant to many Ultra4 teams as it was the 1st qualifier for the 2012 King of the Hammers. Hammerking Productions, the organization responsible for Ultra4 and King of the Hammers, guaranteed that the top 10 Ultra4 drivers would automatically qualify for the 2012 KOH. However, in the event that 6 or more drivers in the top 10 were already qualified, Hammerking guaranteed that a minimum of 5 non-qualified drivers would earn a spot in next year’s race. As luck would have it, 6 of the 10 drivers across the finish line last weekend were already qualified, which meant the top 5 non-qualified drivers included those outside of the top 10. Congratulations to the 5 Ultra4 drivers that are now qualified for the 2012 King of the Hammers: Gary Ferravanti, Jr., Casey Beach, Alex Hardaway, Jesse Haines and Richie Carter. For those wishing to learn more about Ultra4, King of the Hammers or follow the 2011 Ultra4 series, be sure to check out Ultra4 racing’s web site: www.ultra4racing.com and become a fan of the Ultra4 facebook page: www.facebook.com/Ultra4racing. The next Ultra4 Series race will be held May 21st at the Rausch Creek Off Road Park in Pennsylvania.